T-SQL Tuesday #15 is over! This summary took me a little longer than I expected thanks to a late night of production work on Tuesday. Wow 34 blogs for T-SQL Tuesday this time. I really enjoyed reading everyone’s post on Automation. Many of the tasks that I’m working on since coming to a new company are in the blog posts below. It will be great to put these tasks to use quickly in my new position. Hopefully this summary will help others as well to easily find all the answers they need on Automation. 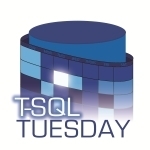 Here’s a link to the original blog post detailing all the information about T-SQL Tuesday #15. Muthukkumaran Kaliyamoorthy started us off showing how to collect critical errors from SQL Server and sending them out through DbMail. Pinal Dave aka SqlAuthority Pinal talks about the good and the bad of Automation. Sometimes Automated jobs can go very wrong and hurt more than they help. I like his perspective on this. Rob Farley Gives us a quick reminder that automation is very helpful to our day to day lives. Noel “Not Null” Mckinney reminds us that T-SQL can automate just by utilizing it for what it was designed for and keeping others from re-inventing the wheel. Good job in setting them straight Noel. Jason E Bacani Jason tells us how to use data driven subscriptions in SSRS to automate the checking of data on a day to day basis. I agree if you can automate something you should! Sankar Reddy lets us know to automate our backups and make sure to automate the testing of the restores. Nick at Dev blog tells us all about the RED product by Wherescape to automate the DataWarehouse load process. Looks like an interesting tool for loading data. Robert Hartskeerl tells us to look into powershell and how much it can really do even though we may still be wired for T-SQL. Ted Krueger shows us a great powershell script using regex to strip off Nolock out of statements. I could see this easily adapted to lots of cases. Jonathan Kehayias aka The Rambling DBA gives us a great post explaining the steps you need to take to automate and manage a large scale SQL Server environment. Even if you don’t have a large scale environment there are great suggestions in here check it out. Chris Shaw poses the question of when do tables need re-indexing and suggests checking out Michelle Ufford and Ola Hallengren’s scripts on Re-indexing. Having worked with these scripts before I would suggest checking them out! Check out the post for the links. Grant Fritchey gives us suggestions on how to keep a server side trace going all the time. Great suggestions from grant on what you should do to maintain the trace. I typically keep my server side trace running every 15 minutes to store the file and load it to the table. I have this fully automated so it’s just a sql job that runs. Kerry Tyler aka AirborneGeek gives us a look at how automation doesn’t have to be fancy and you can use the GUI to get you started on your scripts. I love this approach since I’ve told many people in the past if you want to see how SQL is doing things just script it out and you’ll start to learn. Steve Jones aka way0utwest reminds us to not only watch the watcher (watch your automation routines) but keep things simple and don’t try to account for every single anomaly. This is a great piece of advice as I frequently see people get stuck on scope of a project instead of getting the project done. Matt Velic shows us an excellent way to automate summarization of data and walks us through how to use SQL Agent to make it run daily. Well written and great information. Aaron Bertrand walks us through setting up an entire testing environment with Powershell. This was totally awesome for me as I’ve used VSTS load testing agents a lot at my last position and this hits home as an easy way to get things setup and running. Great use of automation! Brian Garraty aka NULLgarity gives us excellent examples of biting the bullet and going with powershell for his automation. I’m in the same boat on this one and need to jump in with both feet first! Thanks for the push! Robert Davis aka SQLSoldier gives us an excellent post on automating and monitoring Db mirroring. If you’re using mirroring this one would be a great set of scripts to add to your toolbox. Wes Brown aka SQLIO gives us a great example of automating pulling the IO stats for your db’s from sys.dm_io_virtual_file_stats. Having written a procedure just like this last year it gives me some great pointers on things I might want to change. Well done Wes. Karen Lopez aka DataChick lets us know that the lazier you are the better data modeler you will be. 🙂 Just kidding, she shows us that automating tasks helps you to be more productive in the things you need to be productive in. Great suggestions that everyone can use to work better. John Welch shows us a simple and powerful little script to apply XSLT files to XML files changing the xml files. This is simplicity with powershell at its best IMHO, great job. Allen White shows us how to create a script with powershell to backup our logs when they get to close to full. He also mentions a great idea which is automating your automation scripts by making it so objects can be re-created on the fly. I love this idea as well and try to put it into many of my automation scripts. Jason Brimhall gives us a script to size out our database before it reaches Prod. This looks very handy to help you predict what sort of data size you will need in the future. Great script to add to the toolbox. Chad Miller aka Sev17 gives us a script to script out all your SSIS packages from the server to the file system. This can be very handy if you needed to get lots of packages out of the server and into source control or a file backup of the packages. Tom Powell aka Philergia advises us all to use SQL Server CMS to manage our servers and automate all our tasks. This is something I’m planning on looking into in the very near future so it’s a welcome reminder! Brian Davis gives us a script to go through a list of sql servers and grab what account is running the sql server service. Great use of Powershell and automation, I can see using this in the future! Jason Fay aka Dba Star gives us a script to let us know not only when SQL Server restarts but informs you of the status of your databases when you do restart. Sal Young came in a little late but gives us a quick reference to a previous post on reading SQL logs with powershell and codeplex project to monitor your sql servers with powershell. T-SQL Tuesday, Why are DBA skills necessary? I wanted to add my thoughts on this month’s T-SQL Tuesday. Haven’t heard about T-SQL Tuesday yet? Here are the details on it. If you haven’t seen it yet, T-SQL Tuesday is the brain-child of fellow-MVP Adam Machanic (blog|twitter). It happens once a month on the 2nd Tuesday (different this month) and is hosted by a different person in the SQL community each time. The idea is that it’s kind of a rallying point to get a bunch of people to blog about a particular topic on the same day, giving a wide and varied set of opinions and interpretations of that month’s topic. The host then posts a wrap-up commenting on all the contributions. I think it’s a great idea and I contribute whenever I have time. The host for this month is Paul Randal (Blog | Twitter) and here is a link to the original invitation for T-SQL Tuesday post. In my opinion DBA’s are the bridge between Development and Operations. DBA’s possess that level of Technical detail that can allow them to speak in SQL but at the same time talk to the end user/PM/Manager/Customer. A DBA that has these skills can be very effective in fixing problems when they arise. Many people joke about what DBA stands for, DBA = Default Blame Acceptor typically. Whether you accept the blame or not as a DBA it’s a fact that typically you will have many fingers pointed at you when something goes wrong. Typically in the DBA world you are guilty until you prove otherwise. To be able to handle situations that arise regardless of where the blame lands is why you need DBA skills. DBA’s typically possess 2 very important skills that set them apart. Being able to see the 30,000 foot view, like it or not the DB is usually the central source for many applications and processes in a company. The DBA has to understand this and know how lots of different pieces work together. They never have the luxury of only writing there one small piece of code that fetches bacon all day long (apGetBacon stored proc would be nice) . They need to understand the server, network and code to know how it all works together. DBA’s are usually very patient as well, having the finger pointed at you constantly for performance problems or size issues (I’m speaking of hard drives of course) makes you learn to be patient and work through the problems. Most of the time it does appear to be a database issue since that is typically what is central to all the different applications in the company so the DBA has to take the time to find the real problem and to defend the database. It’s a simple fact that the DB is one of the most critical components of many organizations. This fact alone tells us that DBA skills are very necessary to help improve move the business into the future. While this is a great question to ask I hope that businesses start focus on when do we need a DBA to handle one of our most precious commodities?